The helical-bevel servo gearmotors of the BS.F..CMP.. series offer you consistent high performance for exact processes. Their accurate scalability, exact performance and high dynamics are impressive. Force and precision merge into a real unit with the powerful BS.F..CMP.. helical-bevel servo gearmotors. They offer you optimum assembly options and application possibilities thanks to their compact design. 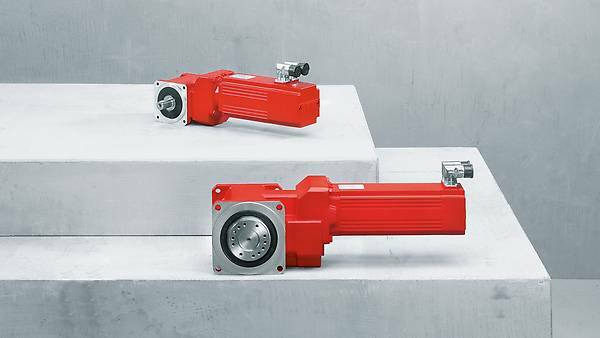 The rotational clearances remain constantly low throughout the entire service life of this servo drive due to the gearing's high-endurance design. The BS.F..CMP.. helical-bevel servo gearmotors are available in six different sizes. Take advantage of the large selection for a wide range of applications that require high torques and precise performance. The same applies for complex automation tasks when several processes are to be merged into an overarching process. By using our helical-bevel servo gearmotors you achieve a high degree of process safety, efficiency and profitability. The BS.F..CMP.. helical-bevel servo gearmotors are extremely robust and low-maintenance thanks to the high manufacturing quality and the tooth elements made with precision. This makes them even more powerful in combination with the precisely controllable CMP.. synchronous servomotors. as the BS.F..CMP.. helical-bevel servo gearmotors develop dynamic power delivery up to 1500 Nm. as precision and dynamics can be combined and accurately controlled.